Another beautiful weekend has come to an end and I had a such a wonderful time hosting another fabulously fully booked edition of my Vintage Pinup Workshop, this time with a halloween theme. I’ll have another blog up later today sharing just a taste of the fun we had! For this week’s Monday Morning Glamour inspiration I have for you the beautiful Eartha Kitt! Eartha Kitt was an extremely talented singer, dancer, actress, activist, author and songwriter. 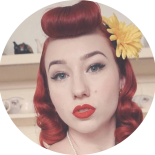 This entry was posted on October 8, 2018 by Miss Lady Lace in Uncategorized and tagged 1940's, 1950's, blogger, glamour, miss lady lace, miss lady laces pinup blog, Monday Morning Glamour, perth, perth pinup, perth pinup blog, pin up, pinup, pinup blog, pinup blogger, pinup fashion, pinup girl, pinup life, pinup lifestyle, red lips, retro blog, retro girl, retro glamour, victory rolls, vintage, vintage blog, vintage blogger, vintage girl, vintage glamour, vintage perth, vintage pinup blog.